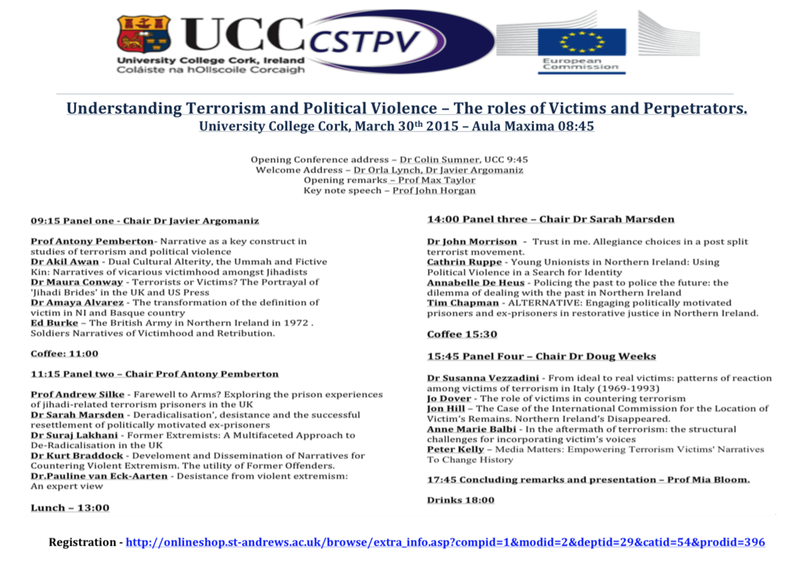 I'm really looking forward to being part of a conference organised by University College Cork and St Andrews' CSTPV next week. Understanding Terrorism and Political Violence: The Role of Victims and Perpetrators looks like it will be a great event with some terrific speakers. Here's an overview of what I'll be talking about. Increasingly, governments are facing the challenge of resettling those convicted of terrorism. This raises questions about the effectiveness of rehabilitative efforts and the best way of ensuring that ex-prisoners will not commit further terrorist offences. Implicated in this is the notion of ‘deradicalisation’. Generally understood to signify attitudinal change indicating a shift away from support for violent extremism, fundamental questions remain about the concept of ‘deradicalisation’, not least whether the term itself is appropriate. Drawing on research with those who work with people convicted of terrorism offences in the United Kingdom, this paper examines three core issues. First, the concept of ‘success’ with politically motivated ex-prisoners. Although fundamental to interpreting notions of ‘deradicalisation’, we have a relatively limited understanding of appropriate aims of work with this population. Based on extensive interviews and fieldwork, the paper presents a framework for understanding effectiveness. Included in this is the issue of offence minimisation, and the value of victim awareness work in addressing this. Second, engagement with those convicted of terrorism offences is interpreted through two theoretical approaches to resettlement in the community: the ‘strengths based’ approach and the ‘risk’ model. The first encourages the individual to conceive of ways to work towards a positive future, whilst the second tries to plug perceived deficits, such as poor educational attainment. Findings from the research suggest that although practitioners saw promise in a strengths based approach, given the risk these ex-prisoners are deemed to pose and the limited knowledge we have of what might promote desistance, a risk model prevails. Finally, the implications of the conceptual and theoretical arguments presented in the paper are explored. The strengths based approach’s potential suggests a reframing of how we approach ‘deradicalisation’ work. Acknowledging the positive personal goals individuals want to achieve by engaging in illegal political activity is the first step in this. Some of the more successful cases of reintegration saw practitioners redirect, rather than deconstruct, the motivation to break the law. Similarly, rather than engaging in any form of explicit ‘re-education’ or ‘deradicalisation’ effort, practitioners generally tried to strengthen resilience by developing intrinsic skills such as critical thinking. An individualised, holistic approach to reintegration is central to this, as is an awareness of the impact the social and political context the individual is being resettled into may have. Rather than a heavy emphasis on the ex-prisoner, contextualising the very significant barriers to reintegration faced by this group is vital. Often finding themselves on the periphery of society, these ex-prisoners are required to (re)integrate but stripped of many of the mechanisms that might make this possible, such as employment or education. Given these conclusions, more appropriate and clearly conceptualised language also seems necessary. Reintegration and desistance seem to be more meaningful and holistic concepts than ‘deradicalisation’ and risk reduction, and moreover, ones that have a theoretical and empirical foundation on which we can build as we develop our understanding of why people move away from terrorism.